Several public pools in Great Britain are now forcing female swimmers to wear Muslim burkinis. British swimming pools are imposing Muslim dress codes in a move described as divisive by Labour MPs. Under the rules, swimmers – including non-Muslims – are barred from entering the pool in normal swimming attire. …Across the UK municipal pools are holding swimming sessions specifically aimed at Muslims, in some case imposing strict dress codes. Croydon council in south London runs separate one-and-a half-hour swimming sessions for Muslim men and women every Saturday and Sunday at Thornton Heath Leisure Centre. 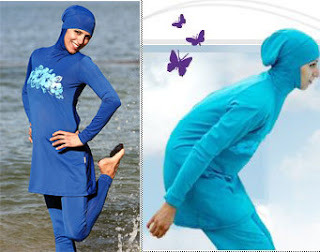 Swimmers were told last week on the centre’s website that “during special Muslim sessions male costumes must cover the body from the navel to the knee and females must be covered from the neck to the ankles and wrists”. There are similar rules at Scunthorpe Leisure Centre, in North Lincolnshire, where “users must follow the required dress code for this session (T-shirts and shorts/leggings that cover below the knee)”.